Oh that's sad to hear! I was wondering why I didn't get back from you. Oh well, no worries =). You know, actually I figured out a way to add very nice effects (for an Ultra setting only) that would use something similar to what you described, only that differently (mapping still done using the RPG Maker map editor). But I am leaving that to the very very end. First I would like to thank all of your support and following so far. It really helps to stay on track. On this opportunity, I'd like to introduce Day at Unveil. Pure gameplay showcasing some of the Survival and Battle mechanics. It's just a bit of everything you can do in the game, but it's a fine sample by itself. If you ever wondered how this game is, or how surviving works, this is the video you have been waiting for. I hope you enjoy! And of course, subscribe to the YouTube channel if you wish to stay up to date. I couldn't see the videos but I can see that the game Is good..
Looks like you set the new levels for RPG Maker VX Ace.. Thank you for your kind words more updates coming soon! That battle system looks so well done. Big call to anyone interested in Unveil or survival games overall. I am looking to define how content progression will happen in the game. Right now, as you level up, you are able to go to harder areas with new content, as well as level-bound events are triggered for you to complete. While this sounds good, it's also SUPER time consuming and involves tons of chances for the game to beak, even more testing that is. So I was considering switching to a more sandbox mode. Levels would still exist and events would still happen, but would be "random" or location based. And then, enhancing the survival properties of the game, like the use of Hydratation (requiring you to find or carry potable water) and so on. If you would like to help out, please PM me your Skype or Google+ and we will get in touch. Thank you all for your support so far! We are closer to release than ever. Today I bring a short video demonstrating a couple new features I am tinkering with: Hydratation and Farming. Potable water can only be found in certain spots, so we need to bear that in mind when we wander off to new areas. We can risk stretching it until we find a new water source, or rush back to the ones we know before we die out of thirst. We can optionally break coconuts to drink their contents, or turn them into water carriers to refill them with water. Farming is not new, but has been thoroughly enhanced. From the Simulation algorithm to the introduction of Watering and Fertilizing. Watering adds water to the simulation cycle of the plant, while fertilizing multiplies how much it grows when it performs photosynthesis. It means you get fruits faster and more often. Fertilizers can poison plants if used in excess, so make sure keep an eye on that while making sure plants have enough water to cleanse the poisoning. That is all for now. I hope you enjoy the video! Once you crack open and drink a Coconut to gain some Hydration, you can reuse it by leaving it on the floor, acting as a water container that can be filled up by rain. Nature is all about recycling, and so is Unveil. Now if you are far from potable water but have some empty coconuts shells on you, rain may save your life! New feature has arrived! Introducing Weapon Mods, allowing to tweak a weapon's skill set. First off, Weapons come with their skill set, and also stats which begin to grow from zero to max as you level them up. The better quality of the craft & materials, the better chances of getting more stats and a slightly higher max level cap. Weapon Mods can be applied by crafting a weapon using an existing weapon. The original weapon will still be delivering the stats it has and absorb the obtained experience gained from battle, but the Mod's skills will be used instead in combat. Turn your Stick into a Poisonous Stick to deal with super defensive or crazy healing opponents! Once a Mod wears out by use, the Weapon returns to it's previous state. Some Mods allow to be modded as well, allowing for several layers of mods, which come back as you break the latests mods.This system allows the player to quickly change strategy depending on the area, without having to craft and level up an entire new weapon from scratch. It's also just plain fun! 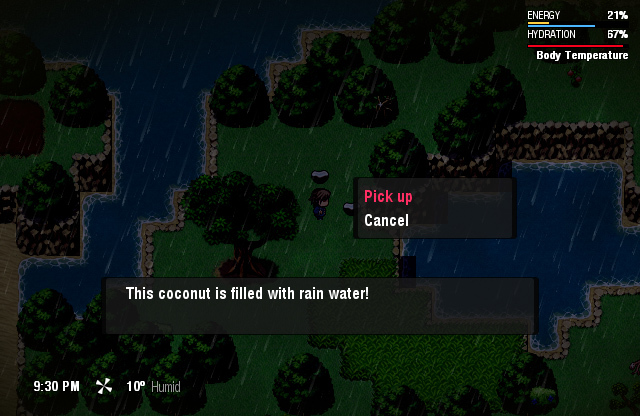 This is beautiful dude, well done... the idea of a survival game is something new to me in RPGmaker, nice. you have a very sentimental atmosphere join on with the music and the wind blowing, did you think about give something for the character to survive for? maybe something emotional to complement that atmosphere, a mysterious photo of someone or a memories that reach the player as it sleeps to another day? just ideas to give more of a propose to play... but none less very nice work dude, keep on. and ow.. PS: You look like Tom Cruise. Actually the game used to have a story like that, but it has been stripped out in favor of a sandbox kind of game. It allows the player to spend more time playing with the survival mechanics you can't find anywhere else, and also makes the whole project more doable. I wanted to share with you the latest User Interface changes to address several learning and readability issues (as well as making it look prettier! ), and explaining the Tokens system more in depth. Hey Pablo! These updates looks awesome. I hope you going to release this game some day, because i want to play it out so much. The UI is so attractive and readable. It's so good to the eyes... perfectly designed, user-friendly. Love it. I feel sorry that almost no one comment on your updates in this site, this needs more attention. I have two questions for you, Pablo: does this game have an ending? and how many items will the game have when finished? also, a third question: does this game has a story or it's just pure sandbox? If it is sandbox, i hope you include the "addictive effect" on it. Think about Minecraft. Anyways, keep it up bro, this is a jewel. I'm going to follow your updates. Oh thank you for your kind words! Thank you indeed it's stuff like this that keep one going. The game originally used to have a story, which was later moved back to "dreams only" (relating the events of how the character got there). Eventually I got rid of all that altogether. Allowed the player to create their own characters instead, and work more on the relationship developed between the player and the character they created, together with everything they will go through. It's more of a "your own story" kind of experience now! Given that, the original ending was stripped out as well. For now, I plan on releasing new episodes (with more content, areas to explore and features) every 3 or 4 months, so the game will not be actually over until I find a good break point . For now, even if I have many ideas in my head, I haven't settled for one. So the game now is an awesome sandbox filled with content and stuff to unveil, all running on top of these very realistic survival mechanics like no other game. The main focus, as you see, has been switched from story centric to experimentation centric. And I love it! It feels way more personal now. Minecraft succeeds in relying on the players creativity rather than official content creation, and the fact that is very very open in the terms of what you can do. You can literally play it in a hundred different ways. It's not the case with Unveil although, even if you still have various ways to plan your own way to survive, in the end it comes down to surviving. It's one game type if you may, versus 100 play types Minecraft has . But unlike Minecraft, it excels at one of those play types, and that is the survival experience. So I am sure survival fanatics will have tons of things to experiment with, and completionists tons of goals to work towards. Thank you again, and do follow the project on Twitter and YouTube to stay updated. Hey guys! Wanted to share with you the latest demoable addition to Unveil: Fishing. It started to be developed for months, but just now I laid down the actual mechanics and polished the simulation. Unveil aims to make fishing feel like in real life. It takes everything into account given it's simulation, with fishes swimming, eating, growing, mating. They like different baits, they are affected by the climate, and way many more things. And just like in real life, you don't get progress bars or get to click fishes to fish them. You wait, and use the little feedback a fishing rod can give you in order to make, together with your fisherman guts, the smarter choice on every situation. Or you may loose your bait, or your rod may even break by overweight. Hey guys! Another update of Unveil. On this opportunity: COCONUTS! Coconuts help regain Hydration or be prepared when water is scarce. Watering plants, cooking soups, collect rain water, and more. I love survival type of games. I have to say, I'm happy there are no zombies. There are too many of those games nowadays. But yes, this looks like a really good survival game that obviously requires a lot of time to figure out the best strategies. It also seems like this would have a lot of replayability. Especially with things like modded weapons, because you would have to decide which weapons would be best to mod. Who knows, this game may be in those "Top Ten Games to have on a Deserted Island" videos that pop up on YouTube (Ironic much?). Speaking of islands though, about how big is this one? Huh, wonder why I didn't get notified of your comment! I tell that to everyone. It's a survival game. No zombies . Indeed. What grants you most of the replayability is the fact that weather is changing, and is not evented. You will be at different places and in different circumstances when night falls, or rain does, in example. But also because of Scenarios, although I haven't talked about that yet. There will be different locations to play at, and it will be hard to describe their sizes (as they also vary depending on the objective of the scenarios - although usually it will be "survive X days in this kind of environment"). But definitely is big enough to not feel caged, but small enough so it's not a walking simulator. Good, it won't be the walking simulator that is minecraft survival (CACTUS! I NEED F*CKING CACTUS! WHERE IS THE DAMN DESERT?!?!)... yeah, that. But replayability will definitely be increased if there are different environments. Then you will need to develop unique strategies for each one, where it be desert, forest, mountain, etc. Wow. This looks amazing. How close are you to having it ready? I like the idea of a survival game. This is really cool. When I first read the abstract I thought it said a "Live a true Survival Horror experience, and I too almost groaned about zombies. But I reread it first, and I am very glad I did. This does really look superb. How long have you been working on it? Is it basically just you alone?